Kurt Cobain Mustang, Other Shape Guitar from Fender in the Mustang series. The Kurt Cobain Mustang pays tribute to a model that the Nirvana star favoured throughout his career. "Cobain liked Mustangs a lot. For one, he preferred offbeat guitars that didn't cost zillions of dollars, and the Mustang certainly fit those two criteria. Also, being somewhat physically diminutive himself, he liked to perform live with slightly more diminutive guitars, like Fender Mustang and Jaguar guitars, which better fit his hands and his reach." The new Fender Kurt Cobain Mustang has features including an angled single-coil Mustang neck pickup and Seymour DuncanJB humbucking bridge pickup mounted directly to the body, dual on-off/phase in-out switches for each pickup, a polyester-finished alder body and an Adjusto-Matic bridge with dynamic vibrato tailpiece. Other features include a classic 24-inch Mustang scale length, C-shaped maple neck with urethane finish, 7.25-inch radius rosewood fingerboard with 22 vintage-style frets and vintage-style ivory dot inlays, four-ply pickguard (Aged White Pearl on Fiesta Red and Dark Lake Placid Blue with stripe models; Tortoiseshell on Sonic Blue model), master volume and tone controls, vintage-style tuners, and chrome hardware. Finish options include Fiesta Red, Sonic Blue and Dark Lake Placid Blue with stripe. Available in right- and left-handed models. 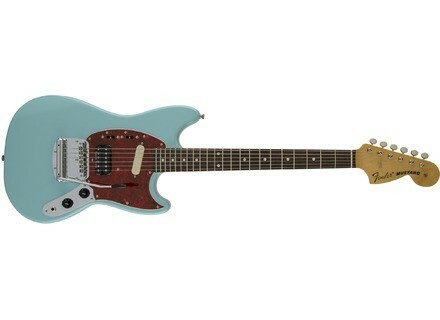 The Kurt Cobain Mustang has a UK RRP of £1,006.80. Visit Fender for more. [NAMM] 3 New Rivera Shaman Effects Rivera Amplification has just released into production three new Shaman series pedals, to be unveiled at the NAMM Show. [NAMM] Gig-fx Pan-Ec Gig-Fx inc. has announced the release of the Pan-Ec echo-panning pedal. [NAMM] Pigtronix FAT Drive Pigtronix comes with a new FAT Drive pedal at Winter NAMM 2012.